Forex Signals Brief for Oct. 17: Are the Majors Looking Shaky Against the USD? Monday is done and dusted and it was a nice one for our followers as the FX Leaders team managed to identify a couple of nice forex signals to get the week started with a bang. Gold continued to be a successful trade for us as well as a couple of our current favourites with the EUR/JPY and GBP/JPY also making some pips. A nice start. Much of the action yesterday was surrounding the USD, as it found some upward momentum in late trade. Today will be a particularly interesting session for the majors as they try to curtail the USD as it tries to keep on moving higher. Have a great day on the markets guys! 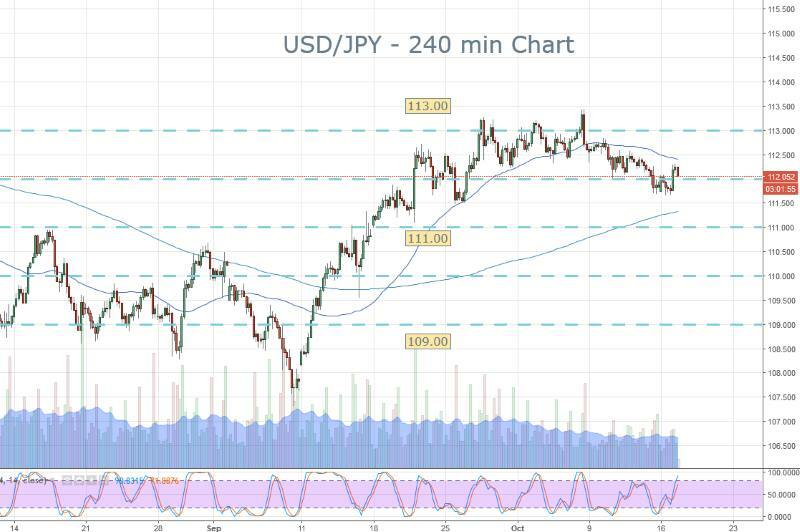 USD/JPY – 112.00 support has held up, are we getting ready for a big breakout? Crude Oil – News has helped oil rally, but the momentum is up. Watch this one closely. Nikkei – Stocks continue to grind higher. Lookout for a pullback here as a potential buy signal. The USD is on the move and that means the majors are getting active. This is what we are currently thinking. EUR/USD – BEARISH: Weakness is coming into the EUR/USD and we are looking to get short. GBP/USD – NEUTRAL: We’ve had a bit of a pullback, but we have seen a strong rally. AUD/USD – BEARISH: The Aussie has tried fighting back, but can’t break higher. Looking to sell any bounce. USD/JPY – BULLISH: This one is getting set to take out 113.00. Watch this one closely for a potential signal. USD/CAD – BULLISH: There has been a steep run-up and slight pullback. Get set to take out resistance in the coming days. Potential breakout. USD/CHF – NEUTRAL: Has been struggling to break to the upside, even with a stronger USD. Weak relatively speaking. The USD/JPY has been in a pretty tight range in recent times. It’s struggled to break out above 113.00 on multiple occasions and at the same time 112.00 support has held up well. Longer term I suspect the USD is going to keep on pushing higher and we will move above 113.00. Yesterday's late spike higher in the Greenback might just be the start of a bigger move up. The Euro has tried hard to bounce back, but it certainly appears that the bull run is over. Again the USD is in control and we are pushing to the downside. If we can hold below 1.1775 then I suspect we might have a nice opportunity to move towards 1.1700. As it stands there is an active short forex signal out on the EUR/USD which is performing nicely. There’s some important data out today for the Euro and GBP, so keep a look out as it will be market moving. If the USD can keep on charging, it’s going to be an exciting day for forex traders with plenty of opportunities around. Good luck guys!